Escape the urban bustle at Wilcox Pass and Sentinel Pass. Eschew the tourist crowds and head to Eagle Ranch Golf Course and Climbing Tours. Venture out of the city with trips to Golden (Rocky Mountain Buffalo Ranch & Kicking Horse Pedestrian Bridge), Columbia Ice Field (in Jasper) and Marble Canyon (in Kootenay National Park). Spend the 24th (Sun) exploring nature at Spiral Tunnels. And it doesn't end there: hike along Wapta Falls, explore the stunning scenery at Johnston Canyon, tour the pleasant surroundings at Plain of Six Glaciers, and glide through natural beauty at Canmore Nordic Centre Provincial Park. 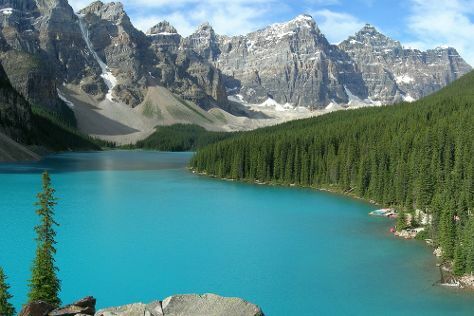 For maps, other places to visit, and tourist information, refer to the Banff National Park road trip planning site . Expect a daytime high around 61°F in June, and nighttime lows around 38°F. Wrap up your sightseeing on the 26th (Tue) early enough to travel back home.